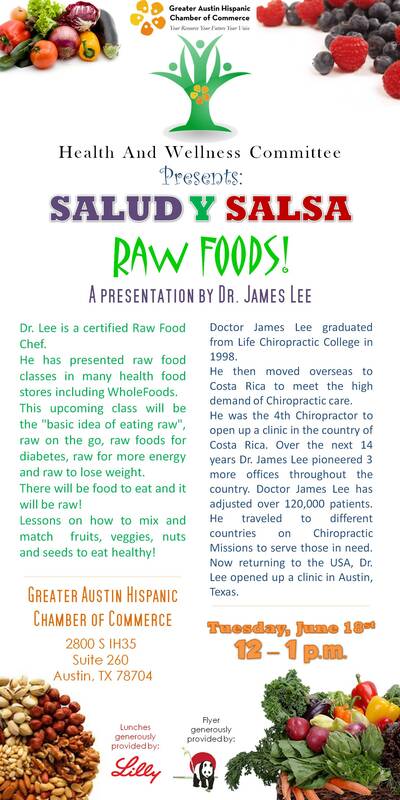 On June 18, 2013 Dr. James Lee will be doing a raw food class. Dr. James Lee is a certified Raw Food Chef. He has presented raw food classes in many health food stores including Whole Foods. This upcoming class will be the “basic idea of eating raw”, raw on the go, raw foods for diabetes, raw for more energy and raw to lose weight. There will be food to eat and it will be raw! Lessons on how to mix and match fruits, veggies, nuts and seeds to eat healthy! Doctor James Lee graduated from Life Chiropractic College in 1998. He then moved overseas to Costa Rica to meet the high demand of Chiropractic care. He was the 4th Chiropractor to open up a clinic in the country of Costa Rica. Over the next 14 years Dr. James Lee pioneered 3 more offices throughout the country. Doctor James Lee has adjusted over 120,000 patients. He traveled to different countries on Chiropractic Missions to serve those in need. Now returning to the USA, Dr. Lee opened up a clinic in Austin, Texas. Please pass this on to your networks. I hope to see you all there!